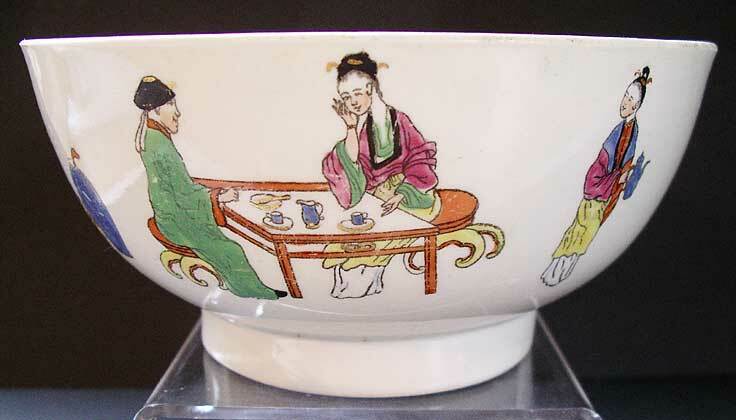 "A rare 18th century Worcester porcelain bowl with printed pencilled outline in black, hand coloured in overglaze polychrome enamels, depicting the Chinese Family or Stand pattern. This is a charming example - a number of domestic scenes of entertaining are played out around the bowl." Antiques Expert Hamilton Bear. Dimensions: width 164 mm max. Marks: Unusual worcester "Meissen' mark in underglaze blue. Condition: Very good with no significant defects to porcelain - no chips, cracks, hairlines staining and free from restoration. 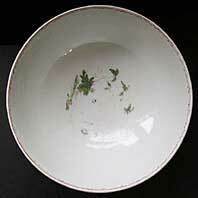 Pattern inside base of bowl is almost worn away by typical usage wear. 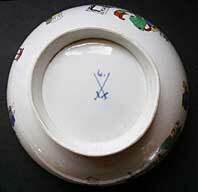 Some wear to red line inner border inside bowl; very minor specs of rubbing wear to painted enamel decoration on outside. Displays very well. All main Chinese family group scenes around the bowl look fabulous.